You can't get much more central than Fresno . Nestled in the heart of the San Joaquin Valley, half way between Los Angeles and San Francisco, Fresno is a mid-sized city of nearly a half million residents. A growing metropolis surrounded by miles of parkland, rolling foothills, and fertile valleys, the city has become the economic and cultural hub of what is today the top-producing agricultural region in America. As the role of law enforcement has evolved in central California , so has the role of Neighborhood Watch. Within the city of Fresno and throughout Fresno County , Neighborhood Watch volunteers are focused both on developing effective crime prevention programs and on cultivating partnerships with first responders and disaster relief organizations such as the Red Cross and AmeriCorps. The opportunity for Neighborhood Watch leaders, law enforcement, and local emergency responders to cross-train and engage in open dialogue has benefited the entire community. Highlighted below are examples of successful joint projects spearheaded by the Fresno Neighborhood Watch community of volunteers. The city of Fresno is divided into five police districts: Central, Northwest, Northeast, Southeast, and Southwest. Each district has its own Neighborhood Watch association, which is assigned a community service officer (CSO) who acts as a liaison to the City of Fresno Police Department. Uniting the five groups is the Fresno Police and Neighborhood Watch Association (FPNWA), a 501(c)(3) organization. At the helm of the FPNWA is Roselyn “Roz” Clark, a 42-year resident of Fresno . Clark and her husband, Fred (an FPNWA board member), have been involved in Neighborhood Watch since the 1970s, when the area surrounding an apartment complex they owned and managed began experiencing a crime wave. In addition to their Neighborhood Watch responsibilities, the Clarks volunteer with the Fresno Department of Public Works, the Red Cross, and CERT (Community Emergency Response Team). Roz also has served as the Fresno Kiwanis Club president and as a member of the Fresno Police Chief Advisory Board. 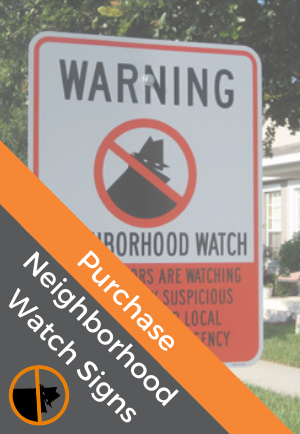 Often called the “eyes and ears” of law enforcement, National Neighborhood Watch has evolved into a multifaceted organization with an expanding role in emergency preparedness. Most notably, the program now partners with Citizen Corps and AmeriCorps (USA Freedom Corps organizations created after the September 11 terrorist attacks to help coordinate volunteer activities that make America's communities safer and better prepared to respond to threats of crime, terrorism, and natural and manmade disasters). Other Citizen Corps partners include CERT, Fire Corps, Medical Reserve Corps, and Volunteers in Police Service. Several Neighborhood Watch members have put their emergency preparedness and response training to the test while providing needed assistance to relief organizations both at home and away. Recently, for example, Clark traveled to Louisiana with a team of fellow Red Cross volunteers to assist Hurricane Katrina victims. “Our hats change when we go into disaster areas. We man shelters, cook, and deliver food and supplies,” she said. 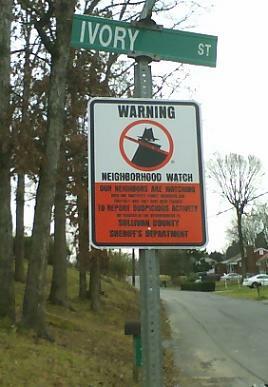 Signage is an integral part of the Neighborhood Watch concept. Block captains routinely cite instances of would-be criminals casing their neighborhoods but driving away frustrated after an encounter with Boris the Burglar® (shown here). Prominently displayed signage lets wrong-doers know, in no uncertain terms, that they are being watched and will be apprehended and prosecuted. The City of Fresno Public Works Department formerly was responsible for purchasing and installing Neighborhood Watch signs. A few years ago, however, budget constraints, coupled by increased labor costs, forced the city to turn this program over to the FPNWA. 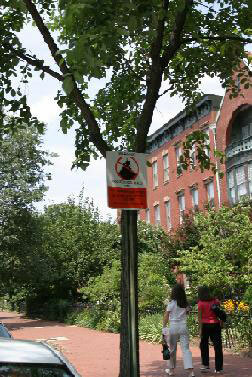 The city offered the association a grant to purchase materials, and, in turn, the association volunteered to supply the labor required to install new and replacement signs. Often glamorized in popular youth culture, graffiti is a perpetual problem in cities everywhere—and has been for millennia! Archaeologists excavating the ruins of ancient Pompeii discovered many colorful messages scribbled throughout the city—from the mundane “Antiochus hung out here with his girlfriend Cithera” to the contemplative “Once you are dead, you are nothing”! Today, graffiti “artists” fall into several categories. Many are bored or rebellious teenagers looking for kicks, some are “wannabes” seeking to emulate the gang lifestyle, while others are actual gang members bent on doing harm. In the 1980s, FPNWA started Neighbors Against Graffiti (NAG) as part of a collaborative effort with the city to clean up graffiti. Contending that graffiti was a crime, NAG successfully convinced the Fresno Council of Human Development to transfer prevention and cleanup responsibilities to the Fresno Police Department. The chief of police contracted with a graffiti removal firm and later acquired its own vehicle, which is dispatched seven days a week to paint over graffiti. The FPNWA is augmenting local law enforcement's anti-gang efforts through a program titled Developing a Partnership for a Safer Community. Partnering with area schools, the police department, and neighborhood leaders, the association hosts an annual conference that unites 500 to 600 attendees from the fields of law enforcement and justice, education, and business in a series of workshops by gang prevention and intervention experts. Last year's featured speaker was a former gang member who gave insight into gang culture and explained how she was able to escape the lifestyle. “No one should have control of a neighborhood except its neighbors,” Clark repeatedly stresses during speaking events. Thanks to a five-year, million-dollar U.S. Department of Justice grant, Fresno city law enforcement and FPNWA leaders have established a program aimed at eliminating crime in an area of central Fresno that has long been plagued by high unemployment and crime. “We will be joining together with the Fresno Police Department and Police Activities league, local drug enforcement agencies, and faith-based organizations to improve community services,” Clark explained. Clark brings first-hand experience to this effort. Until last year, residents in a part of Fresno dubiously nicknamed the “Dog Pound,” lived in fear. Once a quiet community of 4,000 long-time residents, most of whom were homeowners, the neighborhood deteriorated as gangs and drug dealers took over. In response, FPNWA and the city council joined the Fresno Bringing Broken Neighborhoods Back to Life program to organize a community cleanup and two block parties. Asked via survey to select a new name for their neighborhood, residents chose “Brookhaven.” FPNWA funded the purchase of new “Welcome to Brookhaven” signage, which were installed during a public ceremony last summer. The city of Fresno covers only a small swath of Fresno County , which encompasses more than 6,000 square miles (with over 400 sworn deputies and staff,). 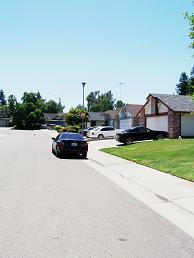 The Fresno County Sheriff's Department relies on the vigilance of the county Neighborhood Watch program. Community activist and small-business owner Marilyn Kelarjian has served as president of the Fresno County Sheriffs' Department Neighborhood Watch for the past three years. Although a separate organization, the Fresno County Sheriff's Department Neighborhood Watch Association regularly participates in meetings and special events hosted by its city counterpart.